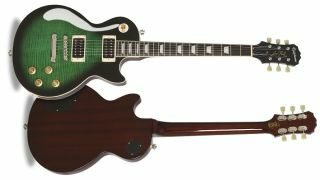 Besides demolishing stages with reunited rock icons Guns N’ Roses, Slash also spent 2018 trotting out a number of signature models, with a cracking deal now available on his Limited Edition Epiphone Les Paul Standard Plus Top Pro. Slither over to Sam Ash, and you can secure one of these beauties for $699 - $100 off the regular $799 asking price. The top-hatted one’s LP is most notable for its AAA flame maple veneer, finished in a Slash-exclusive Anaconda Burst, but it sounds as good as it looks, too, thanks to a pair of Seymour Duncan ‘Slash’ Alnico II Pro humbuckers.